Heather May, who graduated with a First Class MEng in Chemical Engineering in June 2013, has received a prestigious Graduate Prize from the Salters' Institute. 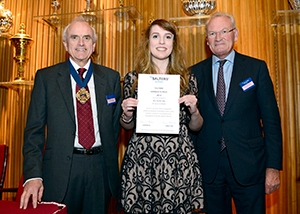 She received her award from Mr Mark Callingham, Master of Salters Company and Sir William Castell, Chairman of the Wellcome Trust, who delivered the address at the prize giving ceremony on 29th November. The prize is awarded annually to first class graduates from UK universities who, in the eyes of the Salters' Institute, show the attributes required to occupy leading positions in the UK chemical and allied industries. Candidates are expected to show some knowledge of the industry's present problems and of the need for changing technology in the future. The interview panel looks for intellectual ability, initiative, effective communication skills, ability to motivate others and a concern for the future of the chemical industry.